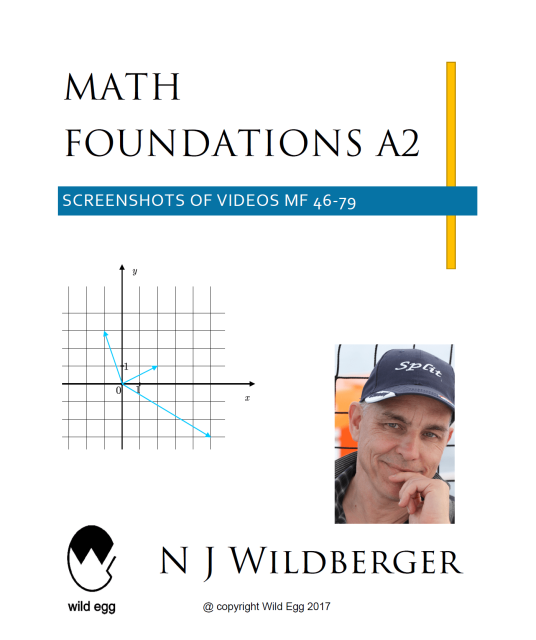 Currently we have more than 200 videos in the series, so we've organized it into smaller playlists, namely Math Foundations A, Math Foundations B and Math Foundations C. Here are the videos in Math Foundations A. 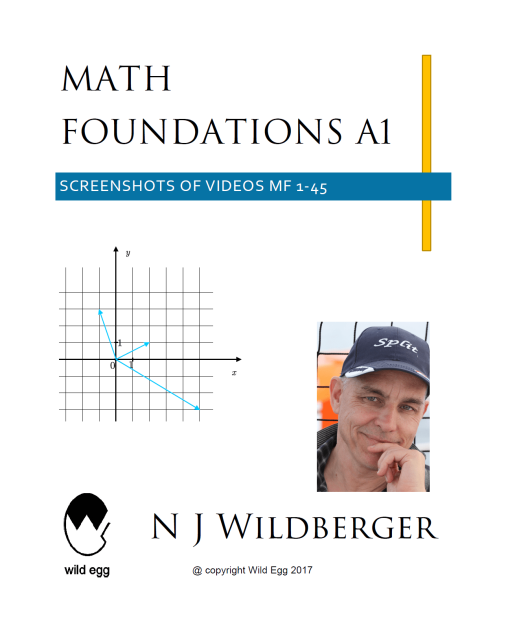 All 79 videos are covered by two screenshot pdfs, which are available here at a very modest price. ​Math Foundations 1: What is a number? Angles don't make sense in the rational number system. The proper notion of the separation of two lines is the `spread' between them, which is a purely algebraic quantity and can be calculated easily using rational arithmetic only. This video highlights some of the advantages in replacing `angle' with `spread'. It also gives an explicit formula for the `inverse cosine' function, which rarely appears in trigonometry texts, despite the universal reliance on this function via calculators. Rational trigonometry works over the rational numbers, and allows us a more elementary and logical approach to the basics of trigonometry. This video illustrates the Spread law, the Cross law and the Triple spread formula. These are among the most important formulas in geometry, indeed in all of mathematics, and they allow us to recast trigonometry into a simpler and more computationally elegant subject. See the WildTrig YouTube series for lots of applications of these laws. Math Foundations 28: What exactly is a circle? ​Math Foundations 30: What exactly is a vector? How to describe all the points on a circle, using a rational parametrization. This is a major improvement on the usual transcendental parametrization with circular functions. Also some interesting number theory arises when we ask which lines through the center of a circle meet that circle. We use vectors to introduce parallelograms, the parametric representation of a line, and affine combinations, such as midpoints. Some comments on the teaching of geometry in primary schools (K-6). I emphasize the importance of the grid plane, as well as constructions and drawing, and give examples of important topics. Math Foundations 33: What exactly is an area? ​While there is a naive idea of area in terms of number of unit squares that can fit inside a region, this is not the best definition. It is better to work with oriented triangles and maintain linearity. How to define the area of a polygon? The right way is to consider signed areas of oriented polygons. This leads to natural formulas that are important for calculus. We introduce translations in the rational plane. However we do not assume the conventional understanding of functions and mappings, which actually has some logical difficulties and conceptual disadvantages. We prefer a cleaner and more flexible understanding emphasizing the use of expressions. We introduce rotations acting on vectors, not points. Angles are not used, but the rational parametrization of the unit circle is important. An interesting formula for the product of two rotations is given. We introduce reflections acting on vectors, not points, in a similar way to rotations in the last video. Now the product of two reflections is a rotation. We begin to address the many logical difficulties arising from the reliance on angles in modern mathematics. The main issue is one of precise definitions: what exactly is an angle?? We give three different answers, including the modern one met by most high school students, and explain why it is really a cheat---calculus is required to make it work correctly. This video continues to discuss difficulties with angles. It takes a historical approach, and emphasizes that with angles, imprecision is unavoidable for most non-trivial geometrical problems. It ends with a challenge problem. The current technology for solving geometrical problems means that answers are typically in an approximate decimal form, and so strictly speaking incorrect. The problem arises with the reliance on angles, which are inherently imprecise. Although angles appear to be simple, mostly due to the linearity they impose on an essentially non-linear problem, they are really full of difficulty. A key reason is that most calculations involving angles also require the transcendental circular functions such as cosx, sinx etc. Here we discuss some of the difficulties and confusions surrounding these functions. [First of two parts] Here we address a core logical problem with modern mathematics--the usual definition of a `function' does not contain precise enough bounds on the nature of the rules or procedures (or computer programs) allowed. Here we discuss the difficulty in the context of functions from natural numbers to natural numbers, giving lots of explicit examples. WARNING: this video and the next de-stabilizes much of the mathematics taught in universities. [Second of two parts] We address a core logical problem with modern mathematics--the usual definition of a `function' does not contain precise enough bounds on the nature of the rules or procedures (or computer programs) allowed. The general notion of `function' does not work in mathematics, just as the general notions of `number' or `sequence' don't work. This video explains the distinction between `closed' and `open' systems, and suggests that mathematical definitions should respect the open aspect of mathematics. So while we may well define `constant functions', or `linear functions' etc, we cannot at once capture the idea of a `general function'. We discuss important meta-issues regarding definitions and specification in mathematics. We also introduce the idea that mathematical definitions, expressions, formulas or theorems may support a variety of possible interpretations. Examples use our previous definitions from elementary geometry. ​Precise definitions are important! Especially in geometry, where traditional texts too often just assume that the meanings of the main terms are obvious. Quadrilaterals, quadrangles and n-gons are good examples. There are three main branches of mathematics: arithmetic, geometry and algebra. This is the correct order, both in terms of importance and of historical development. Here we introduce our program for setting out foundations of algebra. ​Algebra starts with the natural and simple problem of trying to solve an equation containing an unknown number, or `variable'. Here we start with simple examples familiar to public school students. This video belongs to Wildberger's MathFoundations series, which sets out a coherent and logical framework for modern mathematics. The idea is to transform an equation with a variable into a simpler but equivalent equation, which can be more easily solved. We review examples of such manipulations--that go back to Hindu and Arab mathematicians. ​We introduce the algorithm for solving a quadratic equation known as `completing the square'. This technique was known since ancient times, and students should know the derivation, not just the formula. This lecture has a second part, and belongs to Wildberger's MathFoundations series, which sets out a coherent and logical framework for modern mathematics. We introduce the algorithm for solving a quadratic equation known as `completing the square'. This important technique was known since ancient times, and students should know the derivation, not just the formula! We consider three methods, or algorithms, for finding the square root of a natural number we know to be a square. One is trial and error estimation, the other is the Babylonian method equivalent to Newton's method, and the third we call the Vedic method, since it goes back to the Hindus. It is completely feasible to do by hand. One important use of letters in algebra is to describe patterns in a quantitative and general way. We look at the `sequences' of square numbers and triangular numbers, and derive formulas for the nth terms. A table of differences shed light on these and other number patterns. The patterns formed by triangular numbers and square numbers have generalizations in different directions. One is to three dimensional tetrahedral numbers, and three dimensional pyramidal numbers. Another is to pentagonal numbers, which have a number of interesting features. Leonhard Euler was the greatest mathematician of modern times. His work on pentagonal numbers shows that they connect naturally to sums of divisors of numbers, and also to the partition functions. These are both really surprising facts. Algebraic identities are at the heart of a lot of mathematics, especially geometry and analysis. Here we have a look at some simple and familiar identities, such as the difference of squares, the geometric series, and identities that go back to Pythagoras and Fibonacci. The Binomial theorem is a key result in elementary algebra, arising naturally from the Distributive law. We connect Pascal's triangle to the difference table of triangular numbers. The entries are related to paths in a two dimensional array using only two types of steps. Binomial coefficients are the numbers that appear in the Binomial theorem, and also in Pasal's triangle. They are also naturally related to paths in Pascal's array, essentially the difference table associated to the triangular numbers. We also relate binomial coefficients to the rising and falling powers notation introduced by Knuth. The Binomial theorem has extensions to more than two variables. The next interesting case is the Trinomial theorem, which connects naturally to triangular numbers and whose coefficients related to three dimensional paths. There is a lovely three dimensional analog of Pascal's array. We begin the important task of defining the fundamental objects of modern algebra. First we review different roles played by polynomials. We are going to base polynomials on something more fundamental called polynumbers, whose arithmetic parallels but is richer than that of the natural numbers and rational numbers. Polynumbers are extensions of the positive numbers 0,1,2,3... and have an arithmetic which is the same as that of polynomials. In fact polynumbers present us with a more logical and fundamental approach to polynomial arithmetic. This video presents some basic definitions, such as the degree of a polynumber, and then explains addition and multiplication of polynumbers. The latter is not much different from the way you multiply ordinary numbers! Polynumbers are extensions of numbers, but with a richer arithmetic. We will use them to provide a more solid foundation for the study of polynomials. Here we look at multiplying a positive polynumber by a scalar or number, connecting the multiplication of polynumbers with ordinary multiplication in the Hindu-Arabic system, and sketch the proof of associativity of multiplication of polynumbers. Math Foundations 60: What exactly is a polynomial? Polynomials are fundamental objects in algebra, but unfortunately most accounts of them skimp on giving a proper definition. Here we base polynomials on the more basic objects of polynumbers. We introduce the particular positive polynumber alpha, and show that any polynumber can be written as a linear combination of powers of alpha. Then we define a positive polynomial to be a positive polynumber written in this standard alpha form. We discuss multiples and factoring, first for natural numbers, and then for polynumbers. This motivates us to extend our consideration to integral polynomials involving negative numbers. We introduce basic arithmetic with integral polynumbers; the operations of addition, multiplication and subtraction. Simple examples relate to the Binomial theorem and other interesting identities. We introduce the idea of evaluating a polynumber p at an integer c. This evaluation respects the additive and multiplicative structures of arithmetic. Then we state and prove the important Factor theorem of Descartes and its important Corollory relating a zero of a polynumber and a linear factor of the polynumber. We review our approach to natural numbers, integers, fractions and rational numbers. Then we consider the analogous objects for polynumbers. Division of integral polynumbers is similiar to long division of ordinary numbers. There are two approaches: one starting with lower order terms, the other starting with higher order terms. This video introduces a two-dimensional aspect to arithmetic by considering both polynumbers written as columns and as rows, and then putting those two ideas together to define bipolynumbers, whose coefficients form a rectangle. The associated polynomials are written in two variables, alpha and beta, which now have a distinguished meaning as special polynumbers. Decimal numbers are a source of confusion in primary school, high school, university and research level mathematics. Here we begin a rather careful study of these objects, starting with extending the Hindu-Arabic to negative powers of 10, such as one-tenth, on-hundredth etc. ​This video gives a precise definition of a decimal number as a special kind of rational number; one for which there is an expression a/b where a and b are integers, with b a power of ten. For such a number we can extend the Hindu-Arabic notation for integers by introducing the decimal form, with additional digits to the right of the decimal point. Visualizing decimal numbers requires a notion of successive magnifications on the number line. We introduce Laurent polynumbers, the analogs of decimal numbers in the polynumber framework. We first review arithmetic of rational polynumbers/ polynomials, and say some derogatory things about the beliefs of modern pure mathematicians regarding `real numbers' and `complex numbers'. In fact the two most important fields are the rational numbers and the rational polynumbers. Laurent polynumbers are introduced and their arithmetic is described. We begin moving towards calculus with polynumbers/polynomials by introducing the Derivative D=D_1 in a simple algebraic way. First we discuss composition of integral polynumbers, and the translation of a polynumber by an integer. This leads to the Taylor (bi) polynumber/polynomial of a polynumber/polynomial, which contains not only the usual derivative, but also higher analogs called sub-derivatives, denoted D_2, D_3 etc. This video introduces the graphs of polynumbers of polynomials. We plot both integer and rational points, and use straightedge lines between those. We look at a quartic polynomial in some detail. We study lines and parabolas using elementary calculus derived only from algebraic manipulations with polynomials, or polynumbers in our setting. We discuss y-intercepts, slopes and x-intercepts of lines, along with another look at the meets of two lines. Then we study parabolas in the context of quadratic polynomials, using elementary algebraic calculus to find Taylor expansions, derivatives and tangent lines. We continue our study of parabolas as quadratic polynomials using elementary algebraic calculus. We compute subderivatives, tangent lines and Taylor expansions. We apply completing the square to studying the shape and behaviour of parabolas, and derive some interesting geometrical relations related to addition and multiplication. ​We introduce cubic polynomials, and the basic algebraic calculus for them, involving their Taylor expansions, subderivatives and tangent lines and tangent conics. The tangent conics are particularly interesting, and lead to the (arguably!) prettiest theorem in calculus. This is a result due to Etienne Ghys, described in his video lectures on Osculating Curves. We give here an elementary and elegant proof. This is a gentle introduction to curves and more specifically algebraic curves. We look at historical aspects of curves, going back to the ancient Greeks, then on the 17th century work of Descartes. We point out some of the difficulties with Jordan's notion of curve, and move to the polynumber approach to algebraic curves. The aim is to set the stage to generalize the algebraic calculus of the previous few lectures to algebraic curves. Twentieth century mathematics has been object oriented. Twenty-first century mathematics, if it gets its act together, will be much more expression oriented. Here we describe the distinction by studying the key example of the unit circle. ​We illustrate algebraic calculus on the simplest algebraic curves: the unit circle and its imaginary counterpart. Starting with a polynumber/polynomial of two variables, the derivation of the Taylor polynumber, subderivatives, Taylor expansion around a point [r,s] and various tangents are analogous to the case of a polynumber/polynomial of one variable. We get tangent planes and tangent lines both corresponding to the first tangent. The algebraic derivation is illustrated with three-dimensional diagrams involving the associated elliptic paraboloid to the unit circle. The background noise in parts of the video is due to crickets, common in the Australian summer---sorry about that. I will tell them to keep it down next time. ​We investigate the Folium of Descartes, viewing it both as a cubic curve in the plane, and as a surface in three dimensional space. This is an extended exercise in algebraic calculus. We parametrize it, calculate Taylor polynumbers and expansions and tangents, and interpret them both as tangent planes of tangent lines, or as tangent quadrics or tangent conics. We finish with a pleasant duality satisfied by the tangent conics.